NUS biophysicists have discovered new conformational changes and structural dynamics of the dengue virus during their transfer to human hosts. Dengue infection is a mosquito-borne tropical disease caused by the dengue virus. It affects some 400 million people worldwide and is one of the most common mosquito-borne viral diseases in Singapore. Dengue infection can be fatal and there is no effective treatment available. It is transmitted by the bite of the female mosquito and can not be spread directly from person to person through contact. A mosquito is infected if it is fed by a person infected with dengue and the virus is transmitted to other people when the infected mosquito bites them. Prof Thorsten WOHLAND of the departments of Biological Sciences and Chemistry, NUS and his research team have discovered that the structural dynamics, but not the specific morphology of the virus, is correlated to the ability of certain strains of dengue viruses to detect an infection (infectivity). While the structures of the dengue virus change dramatically in the mosquito and human hosts due to temperature differences, neither the infectivity nor the structural dynamics of the envelope of the virus change. The infectivity and structural dynamics of the dengue virus are only affected if it is exposed to feverish temperatures of 40 degrees C. At 40 degrees C, the virus infectivity falls more than three times and the virus is 2.5 times less structural dynamics. These findings offer enormous potential for devising new strategies to block dengue infections by focusing on the structural dynamics of the virus. When the dengue virus enters a human host, there is a change in temperature from about 25 degrees C (inside the mosquito) to 37 degrees C (in a healthy human) or 40 degrees C (in a dengue infected human). This temperature difference causes the dengue virus to "swell" and become about three times less infectious. However, this loss of virus infection occurs only after the dengue virus has experienced a temperature of 40 degrees C. The team also discovered that in the absence of divalent cations (Ca2+Mg2+), the dengue virus will remain in its "bloated" state even when the temperature returns to 25 degrees C. This happens when the virus is returned to a mosquito from a human host. The dengue virus will only partially contract in the presence of divalent cations. 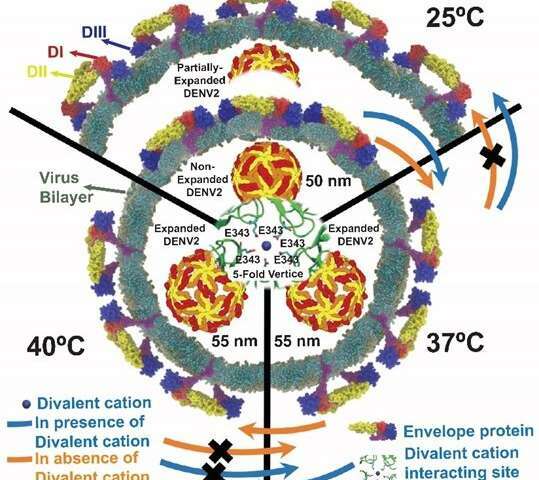 By monitoring the influence on the dengue virus due to the temperature and the presence of divalent cations, this work has helped to determine the correlation between the structural dynamics of the virus and the infectivity of viruses. Prof. Wohland said, "Our research team is expanding plans for in-depth research into dengue and its life cycle, and we are also extending these strategies to other closely related viruses to provide new clues for the development of antiviral strategies." Figure with the morphological and structural changes in the dengue virus at different temperatures. At 25 degrees C envelope proteins remain on the membrane of the dengue virus in the vicinity and the diameter of the virus is 50 nm. When the temperature rises to more than or equal to 37 ° C, the distance between envelope proteins and virus increases. This leads to the "puffing" of the dengue virus and the diameter increases to 55 nm. The team discovered that when there is a drop in temperature (back to 25 degrees Celsius), the dengue virus will partially contract if divalent cations are present in the environment. 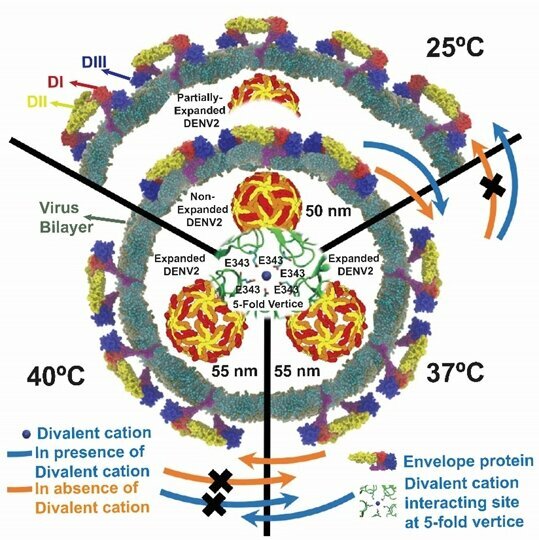 DI, DII and DIII are three exposed domains of the envelope protein on the virus surface.